#279. Flowers in a Basket on a Table. 5 x 6, oil on canvas. No inscription. The back has two labels. One is a white stick-on label showing a handwritten "Th? Kurdian". 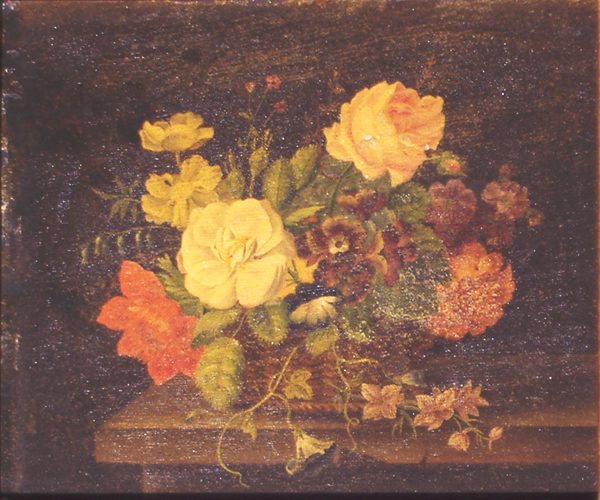 The other is a Frost & Reed (London) label showing "F. R. Registered Number 4007 / American 1836-1903 / Artist: Gilbert Munger / Title: Flowers in a basket on a table. / 5 x 6. d. d. x." We know of one other still life by Munger (#245) and it is solidly authenticated. The painting here has some resemblance in style to that, plus the Frost & Reed sticker (from 1946 according to that firm) indicates that they were willing to attribute it to Munger. So. although unsigned, this work has a high probability of being from our artist. Bought around 2000 in Prescott AZ "from an antiques store that offers little booth for yard-salers to unload their buys" by the current owner.